T.J. Zeuch isn't much of a strikeout pitcher, but he proved just how effective he can be pitching to contact Thursday. 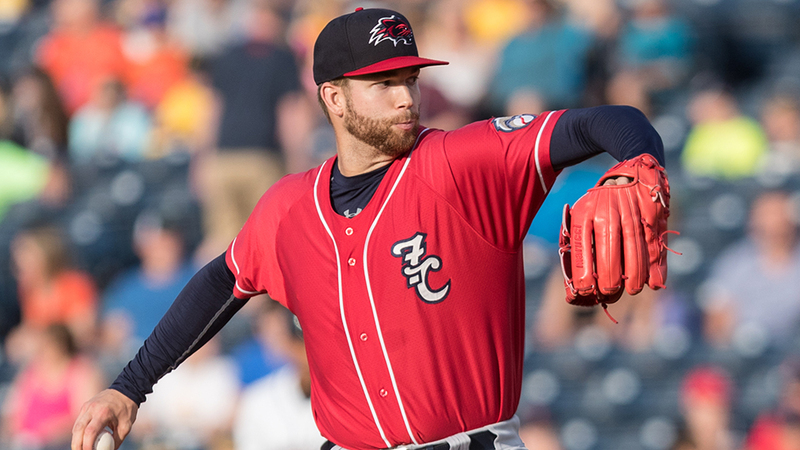 Toronto's ninth-ranked prospect allowed two hits and a walk over eight innings to win his fifth straight decision as Double-A New Hampshire blanked Akron, 3-0, at Canal Park. Zeuch tallied four strikeouts and lowered his ERA to 2.81, which stands fourth-best in the Eastern League. "My strikeout pitches haven't been where you want them this year," Zeuch said. "I'm continuing to work on that, just kind of throwing better and later breaking off-speed pitches in order to bump those numbers up. But in terms of keeping the ball down, it's huge, especially when I'm getting early swings, early contact. When I start leaving that ball up, it leads to obviously a lot of base hits. The game can get out of hand really quick." The 23-year-old found himself consistently pitching with runners on base in the game's early stages. Indians No. 23 prospect Ka'ai Tom worked a one-out walk in the first inning, but the right-hander got two groundouts. He erased Willi Castro, who reached on a fielding error by second baseman Gunnar Heidt, by inducing a double-play grounder from Sicnarf Loopstok to end the second. "Any time you can get a double play, I think it's a momentum killer for the other team," Zeuch said. "If I get a guy on -- whether I walk him or give up a base hit -- my mind-set goes immediately to 'Let's get a double play here. Let's get a ground ball at somebody. Let's give them a chance to turn two.' Because I know they're going to turn it 99 percent of the time, unless I give up an absolute rocket or a slow ball they don't have a chance to turn two on." The 2016 first-rounder utilized the double play again in the third and retired the side in order in the fourth before working around a one-out single by Castro in the fifth. The Mason, Ohio native retired the final 11 batters he faced. "I think I kind of found the groove," Zeuch said. "I was making small adjustments throughout the game. My breaking balls weren't so good early on in the game. I think I found an adjustment that really helped those out. I was getting more swings-and-misses on those, some weaker contact on them. I was able to throw them down more. Having good momentum with my catcher, [Max Pentecost], he knows what I want to throw, when I want to throw it. So it makes it really easy." Although he put an exclamation point on his outing by striking out Sam Haggerty looking on his 86th and final pitch, Zeuch benefited from weak contact early in counts to keep his pitch count low and give him the opportunity to go deeper into the game. The University of Pittsburgh product threw 58 strikes and used 15 ground-ball outs to complete eight innings for the first time of his career. "The biggest key is having a great defense behind me like I do," he said. "Every ground ball that's put in play, I feel like that's an easy out. I have the utmost confidence in everybody playing behind me. It's a really relaxing feeling out there knowing that if a ball is put in play, there's a pretty good chance it's going to be an out." Going forward, Zeuch (7-5) wants to improve his changeup to give him a fourth weapon with which to attack hitters. "Being able to a more effective changeup is going to, honestly, give me more strikeouts," he said. "Because it gives me a four-pitch mix, so they're not really sitting on a breaking ball in two-strike counts or sitting on a fastball in fastball counts." Zeuch's trend had been pointing in this positive direction. The 6-foot-7 righty credited his midseason turnaround with an adjustment in keeping his front side closed and focusing on finishing his pitches, making the change after watching his successful innings from last season. He has turned in five quality starts in a row, surrendering six runs over 35 2/3 innings in that stretch. "I don't think I've ever had a team this good behind me, a team that I can be this confident in front of," Zeuch said. "If I give up one or two runs, I know for a fact that we're not out of it. We're probably going to put up five, six or seven runs a game easily. So it definitely helps to have a lineup like that to just keep the ball in the zone, put it over the plate, let them put it in play. Because if they do get a couple cheap shots here and there, it's not really going to affect me too much." Lefty Jose Fernandez worked around two walks in the ninth to record his second save of the season for New Hampshire. Heidt, Jonathan Davis and Jon Berti drove in a run apiece.